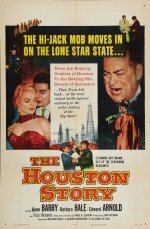 Barry gives a terrific performance as a Texas oil worker who ruthlessly works his way up the ranks of Arnold's mob. Gritty Sam Katzman production is efficient if unremarkable. Notable for casting Hale as the femme fatale and Cooper as the nice girl.